I had my first run-in with a stink bug yesterday. It was terrifying. It had infiltrated my vehicle and launched an overhead attack as I began driving. I took a hit in the noggin before I was able to get the window down and shoo it out. I had never encountered this insect prior in my travels and a quick google search revealed the reasons why. The brown marmorated stink bug (Halyomorpha halys) was first documented in the United States in September of 1998 in Allentown, Pennsylvania (Yes, Billy Joel's song) - probably a stow-away on a shipment from China. Having no natural enemies in the United States, the bug has flourished and spread throughout the Northeast. The bugs have been known to feast on a wide range of fruit and vegetable crops and have caused problems this year on farms and orchards in Pennsylvania. Generally the punishment for being found guilty on the charge of being a bug in my household is death by squish. Luckily I was warned by co-workers in advance that such a punishment of these particular insects would most definitely backfire - the infamous 'stink' for which they are named. My curiosity overtaking me once again, I set out to find out what was the cause of the stench. A 2006 study done at Clemson University used Gas Chromatography and Mass Spectrometry to determine at least two of the compounds present in the stink bug odor: the aldehydes trans-2-decenal and trans-2-octenal. These two compounds are used in the food industry to add flavor and aroma to products. The trans-2-decenal, also known as decenaldehyde is described as having a "powerful waxy orange aroma" by the Joint FAO/WHO Expert Committee on Food Additives (JECFA). The trans-2-octenal is described as having a nutty flavor and an odor described as waxy or like a cucumber. In the world of food chemistry it is can found used in bakery items or dairy products. These two aldehydes sound like they might actually smell good, or at least tolerable, but apparently when these are emitted by the stink bug through its abdomen it is not only a very effective defense mechanism, but the source of its common nickname. 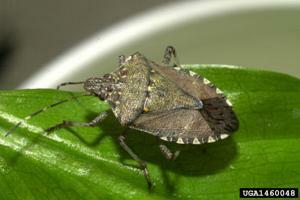 Any other stories out there related to stink bugs? Cool entry. Now it makes me wonder, what chemically happens when those compounds are emitted through the Bug&#039;s adomen. Did the molecules change its form? Or was there some nitrification happening in the Bug&#039;s adomen? That I don&#039;t know (if anyone out there has an idea - please speak up!). I do know that some people can crush the bugs with their bare hands and not have any kind of reaction to the secreted chemicals, and others have just touched them by accident and have what look like chemical burns from the secretions (perhaps just an allergy). Close encounter. Is that like, sometimes you get the organic lab and sometimes the organic lab gets you? Thanks for the analysis! The smell of cucurbits can be overpowering, it seems some stink bugs (leaf-footed, in particular) might be recycling trans-2-octenal (the smell of the bug to me does resemble a cucumber gone over to the dark side). If trans-2-octenal is in cucumbers, does it offer any protection, perhaps against other insects?